Weekly catch ups with my favourite blogger are usually over amazing food and cocktails, and Foley’s was a spontaneous decision but one which exceeded both our expectations. Neither of us had even looked at the menu before we arrived and so didn’t know what to expect. All we knew was that at the restaurant’s helm was the Palomar’s ex sous chef, Mitz Vora. That was a good sign for me, having dined at the Palomar recently and having had an amazing meal. The cuisine is inspired by the spice trail with flavours from the Middle East and Asia. As we entered, we could see the bartender Isaac preparing what suspiciously looked like Mojitos to me, and I was sold. The space looks deceptively small but is actually a 70 cover restaurant split over 2 floors. We didn’t have a booking and it was really busy, but were delighted to be given seats at the bar, which definitely was a major plus in terms of cocktails being within reach and also really good lighting. I went for the Spiced Pear Mojito, which was a mix of Appleton rum, homemade spicedpear purée, lime and mint, and Aftab went for the Foley’s gin & tonic, which was such a pretty colour and made from Portobello Road gin, grapefruit and pink peppercorns. For nibbles, from the “Bits and Bobs” section, we had the Indonesian peanut crackers served with spicy Tomato sambal, which were unusual but delightful, and roasted lotus seeds, which were on the house and had a really lovely kick. The dish that won both our hearts was the Charcoal grilled chicken ‘burnt ends’ which were cooked in a Korean BBQ sauce and garnished with , spring onions and sesame seeds. The chicken was so well flavoured and the dipping sauce with it was like the perfect match in a marriage. Having eaten at both the Palomar and Barbary, the vegetarian dishes always have such an unexpected win over the meat dishes for me, and the same happened here. The cauliflower dish, which was served with Tzatziki, tomato, and smoked peanuts, was moreish and so tasty. 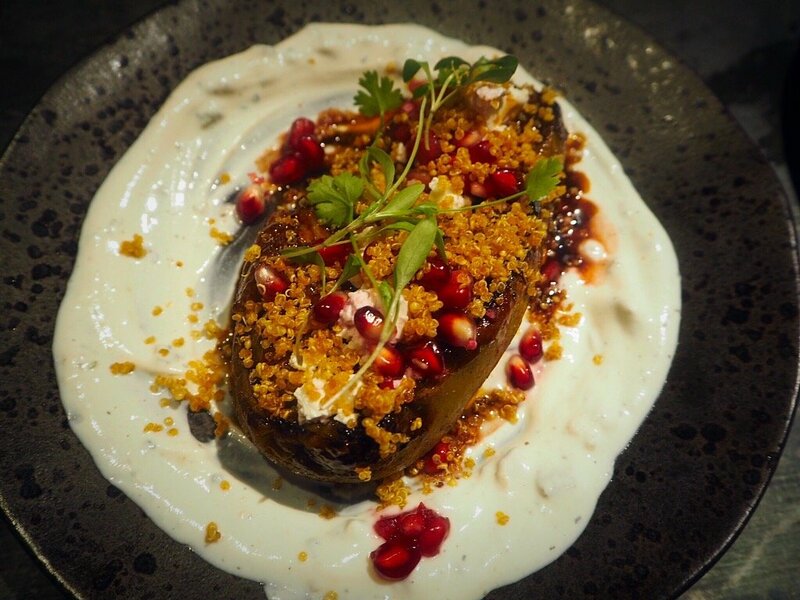 My second favourite dish of the evening was the earthy Aubergine cooked and served with Pomegranate, dates, chilli lime yogurt, puffed quinoa and feta. It was these unique flavour combinations that blew us away and each dish was so well seasoned, flavoured and had a taste experience like no other. So far the Aubergine dishes at Palomar, Barbary and now Foley’s have been amazing so if you are an aubergine lover like me be sure to order them! On to the meat dishes. I went for the Pork Belly, having been intrigued by all the various ingredients alongside it on the menu. Served with Tamarind BBQ, apple, green papaya, buttermilk, cured red onions and toasted cashews. I had eaten a different Pork Belly dish at lunch earlier and in comparison, this dish although very tasty, didn’t blow me away. If I didn’t have a dish to compare it to I would have loved it more. Cornflake crusted popcorn chicken with Pickled shimeji, corn, endive and chorizo didn’t do it for either of us. It had lovely flavours on paper but in execution we just weren’t wowed by it. I was slightly disappointed as when we were browsing the menu to decide what to eat, it was this dish that caught my eye first. Aftab went for the Sticky beef served with Daikon cucumber som tam, avo& kaffir lime purée and crispy shallots. He loved this dish and the flavours were all very refreshing, zesty and complimentary to each other. We were both having such a good time we even ordered another round of cocktails and went for the same choices, the Mojito and G&T. We ended our meal with a very heart warming literally “hug in a mug” homemade chai, with sweet notes of cardamom and sugar and other spices, served with a super adorable dark chocolate spoon. I really recommend trying Foley’s for a very different take on flavour combinations, lots of spice, fun ambience, good cocktails and not too extortionate prices. This is a good venue for a catch up or even a date night. What a lovely night! I think I’ll need to add this place to my list as I loved the food at The Palomar. That aubergine dish sounds right up my street and that chocolate spoon combined with a cup of warming chai might just be the most tempting sounding end of meal hot drink ever! !